First off I need to start this review with saying it really isn't a review! 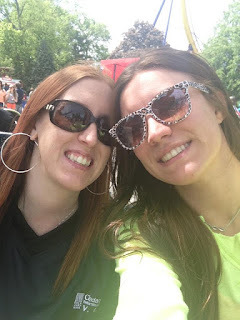 Born and raised a Michigander has certain perks and advantages such as living within driving distance to the Best Amusement Park in the World (yes the whole world!) I truly feel as though the purpose of telling you about my most recent visit is more to educate those not from the area and to make others just plain jealous of the adventure we were able to take last week! Cedar Point is located in Sandusky Ohio which is honestly quite a small town and undeveloped area in my opinion. 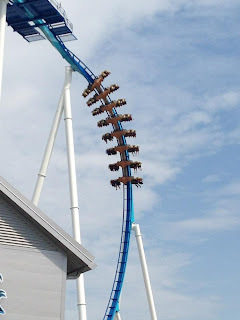 "With 16 roller coasters, Cedar Point amusement park/resort is home to the largest collection of coasters on the planet and has been voted the 'Best Amusement Park in the World' for a record 15 consecutive years!" What an accomplishment! 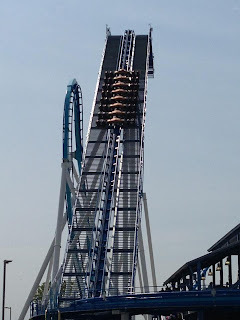 This year I was fortunate enough to attend Cedar Points Blogger Media Day and to bring several of my friends and family. 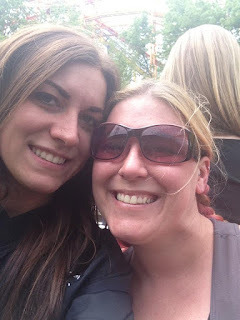 This was such a perfect opportunity because it has actually been several years since we were last able to travel there be it I was either pregnant or the weather was terrible for the days we had planned. 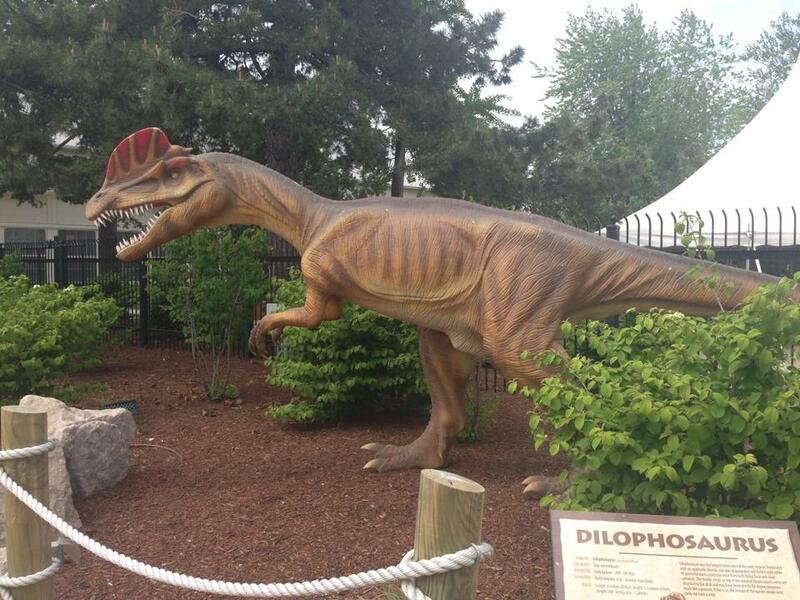 Throughout the park you can find 72 rides including four children’s areas. There is also the separate but gigantic Soak City Waterpark. Since we had a special VIP spot to park in at the back of the park we were actually able to walk through the Callenge Park as we entered Cedar Point. This exciting area includes the "SkyScraper, the RipCord™ Skycoaster, two high-speed go-kart tracks, and two challenging 18-hole miniature golf courses." Best part about this is that admission to Cedar Point is not required as these are just a separate fee depending on which you want to 'challenge' yourself to. If you decide to make the trip an over night one you can stay at one of four resort hotels - Sandcastle Suites, Hotel Breakers, Breakers Express, and finally Castaway Bay which includes a year-round indoor water park. There are also two marinas if you (or a friend) have a boat you'd like to sail up and stay in. Or if you are the roughing it type you can stay at the luxury RV campground with cottages and cabins (so not really roughing it lol). First thing you are going to want to do is buy a Fast Pass. Yes, these are ridiculously over priced and honestly one of the many ways the park makes complete bank off of people. However, there is nothing like literally walking up to whichever ride you choose and getting to ride it right away verse waiting two hours in between. You are potentially only getting to ride 5-6 rides without the fast pass whereas we rode several of the coaster 2-3 times in a row. *I do want to note a few additional things to consider when buying the Fast Passes though. Don't question yourself when buying them, if there are ten people in your party get ten wrist bands (as they discount the price the more you buy). We didn't at first and ended up making 3 separate purchases costing us twice as much since half of us thought we didn't need them or didn't have the money. Second, make sure all the rides are open which use fast passes. For our group of 12 we spent over 1k for the passes and several of the rides were closed down for the day or broke down half way through the day which was beyond disappointing! Another thing you will want to do in the beginning of your trip is purchase one of the Cedar Point red cups with lid and straw. I believe they were around $12 each BUT not only do you get the souvenir cup you also get free refills on soda or water ALL day. 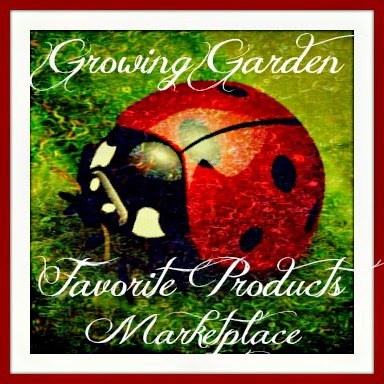 Because there is a quick stop beverage station or even dozens of restaurants throughout, you can refill anytime you get thirsty and honestly don't have to spend additional time in line to purchase the drinks. Another quick note I want to make is when traveling to the park with someone who is pregnant, to short to ride the coasters, or has some other medical condition preventing them from riding - they will NOT be able to stand in line with you and then duck out at the last minute. They are not even allowed past the entrance to the lines. My pregnant sister was stuck at the exits holding our stuff throughout the park so just take note and be prepared for this. 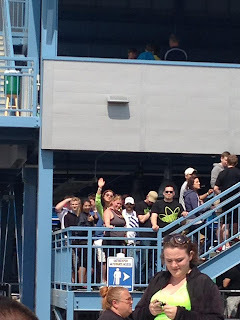 This time we visited the park we actually encountered an "accident" that someone in our party had which gave us an amazing opportunity to see not only how helpful the Cedar Point Staff is but all the different things the park has to offer. 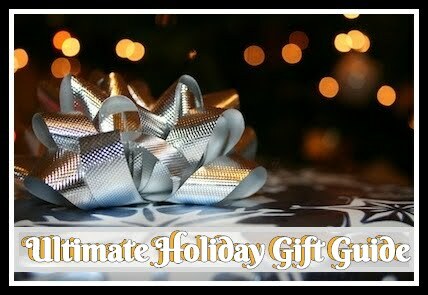 We were able to shop in the various gift shops until we found suitable replacement clothing as well as found that the CPR/emergency area located in the center handed out things like band-aids and feminine products to those in need. 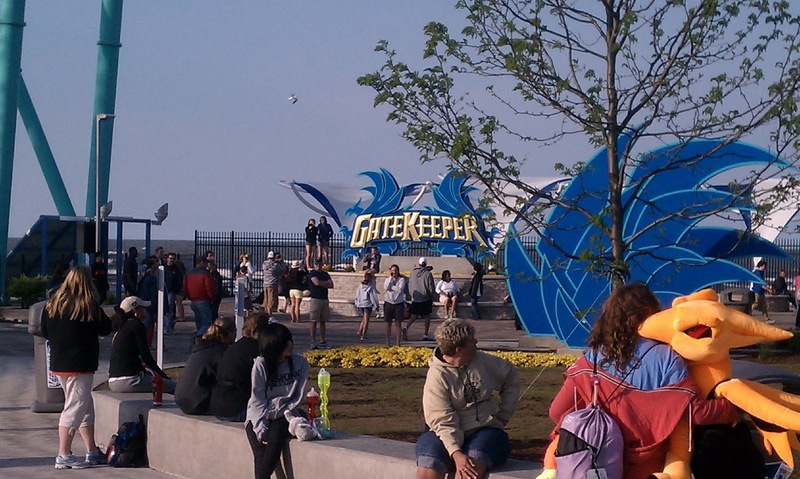 Of course this year, we were most excited to ride the newest roller coaster at Cedar Point - The GateKeeper! 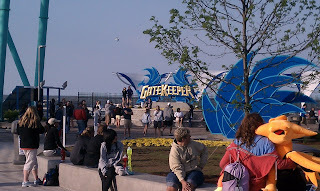 "GateKeeper is the tallest, fastest and longest wing roller coaster in the world" breaking 7 world records! I noticed right away this was not one of those rides that's over before it starts being a long 2 minute 20 seconds of excitement. Now I am normally a back car rider but for this one you definitely need to be in the front car to experience the full fear of threading through two keyholes which barely look big enough to fit through! At the end of the day I polled everyone in my group as to what their favorite roller coaster was especially since some had been there last season and others not in the last decade. 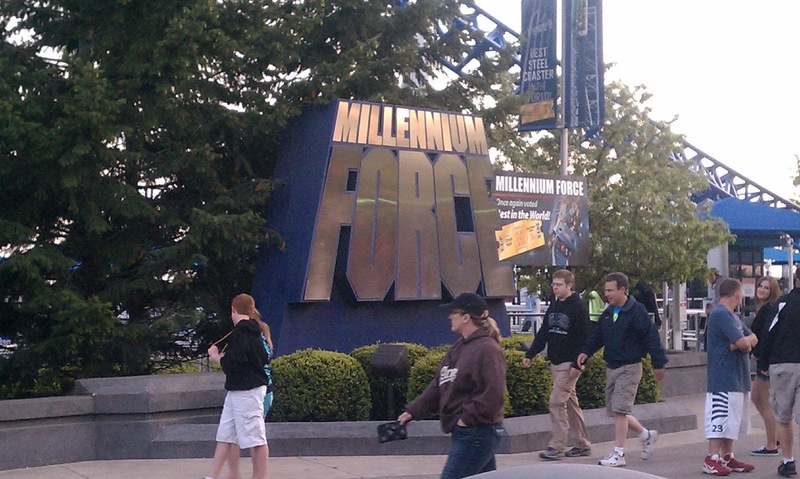 Overall the reigning champion is Millenium Force with a tie for second between the Gate Keeper and the Maverick! 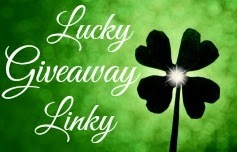 Giveaway: Cedar Point is going to give one of A Lucky Ladybug's lucky readers (4) Tickets to the Park of their own! Do the 4 tickets work at any Cedar Point owned park?